One of the excellent questions we have been asked throughout this process is how we are able to stay in another country for one year without being citizens or residents of that country. If you are a U.S. citizen, or a citizen of a number of other countries, you do not need a visa to enter Costa Rica. You simply need a valid passport and a ticket (bus or plane) showing you are leaving the country within 90 days of your arrival. 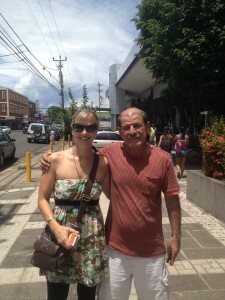 There is a myth that you have to be outside of Costa Rica for at least 72 hours. My understanding is that this is false and stems from confusion over a customs law. Since our objective was not only to enjoy Costa Rica, but also to travel to Panama, Nicaragua, and back home to the U.S. on occasion, we didn’t view the requirement of having to periodically leave Costa Rica as a negative. Because of where we are living, we determined that the most logical place for us to cross into Panama was at a border town called Paso Canoas. From what I can tell, one part of Paso Canoas is officially in Costa Rica and the other part is officially in Panama. Although we have traveled a decent amount over the years, we haven’t had a ton of experience crossing international borders via land. Kenya/Tanzania, Belize/Guatemala, Spain/Portugal, and U.S./Canada are just about the only ones we’ve done in a car or on a bus. Having had those experiences was enough to make me wonder whether the Costa Rica/Panama border would be a confusing and stressful process. I talked with numerous travelers who said crossing between Costa Rica and Panama was the easiest border-crossing they had ever done. I talked to others who said it was the worst. For us, it was an ordeal we’d like to forget. Since we own a car, we figured we’d drive into Panama as opposed to taking a plane or a bus. Driving is convenient, but it adds another layer of complexity. Incidentally, I don’t believe Costa Rica allows you to drive a rental car out of the country, but that’s something that would be easy to verify with your rental car company. Once we made the decision to drive, the first action we had to take was acquiring the proper documentation to leave Costa Rica with our car. 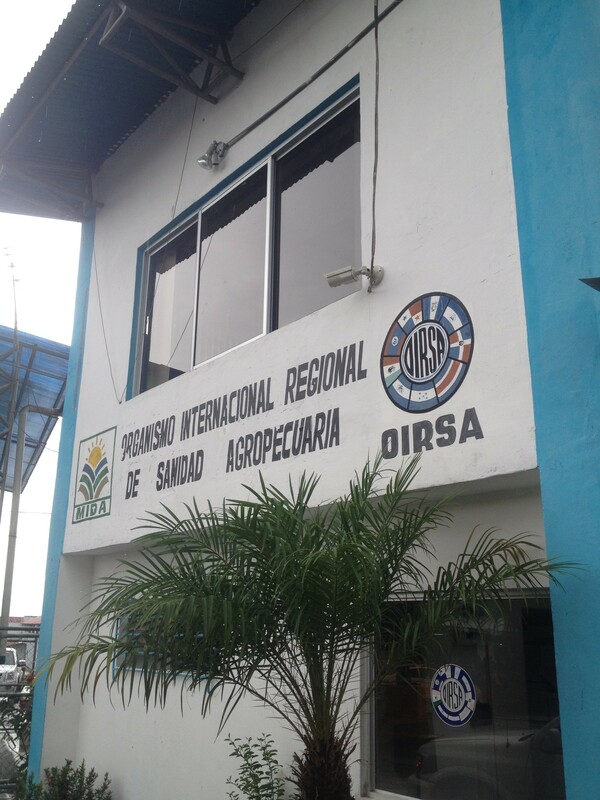 This involved a trip to the Registro de la Propriedad in Puntarenas. Locating this agency was another lesson in how one’s own preconceived notions can be detrimental. Our understanding was that this office was near a bank. So we were using the bank as a landmark. What we came to learn was that the office actually is located inside of a bank. At the time, I complained about how nonsensical that was. As we have talked about it after the fact, however, it makes sense. 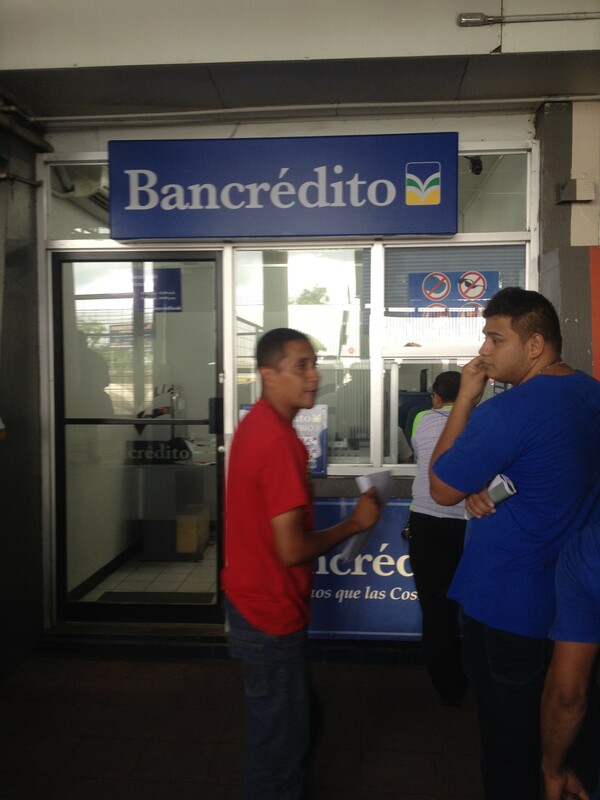 It is located in the Banco de Costa Rica, which is one of three banks owned by the government (the other two being Banco Nacional de Costa Rica and Bancredito). Viewing it from that perspective, it’s actually not that strange that a government office would be located in a government-owned entity. Manuel couldn’t have been a nicer person. Here we are at the Registry inside of the BCR in Puntarenas getting the document to leave Costa Rica with our car. A large component of traveling is adapting and adjusting. That means you probably are going to do some things differently than you would do at home. Thus, after driving all over Puntarenas, we stopped and asked someone for directions, something I am reluctant to do. Instead of routing a path for us, he insisted that it would be easier to get in our car and direct us to our destination from the back seat. If you’ve traveled a little, you know this is a horrible idea for multiple reasons. He could (a) kill you, (b) rob you, or (c) ask you for a bunch of money even if you do reach your end point without winding up in the news. If you’ve traveled a lot and you are a decent judge of character, however, there is an option (d). He could be an extremely nice person who has been a musician all of his life, owns a dueling piano bar, and will not take a single colon for his effort in helping you navigate the roads of a foreign country, despite the fact that it took time out of his day. Fortunately, option (d) is what transpired. 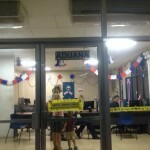 Once inside the Bank of Costa Rica which housed the National Registry, we used a mix of Spanglish and Google Translate to explain why we were there. After providing 8,000 colones (about $15.00 U.S.), our passports, the vehicle title, and the vehicle registration to their very accommodating staff, we were given the document allowing us to drive our car out of Costa Rica and into Panama. This document remained valid for 20 days from the date we received it. At that point, we were ready for our journey. As I have mentioned in previous posts, we try to minimize our night-time driving in Costa Rica. It’s not because it’s dangerous to drive in the dark due to crime. Rather, it’s perilous due to the lack of reflectors and lighting, not to mention the curvy roads, steep mountains, rain, fog, and random objects that might be on the road (such as animals, strollers, and people). Thus, the plan was to leave our home by 6:00 am, arrive at the border by 10:00 am, get back to the border (after having spent some time in Panama) at about 2:00 pm, and then begin making our way back to Jaco as dusk set in at roughly 6:00 pm. Needless to say, events didn’t unfold quite like that. In fact, we were still in Panama when darkness arrived. 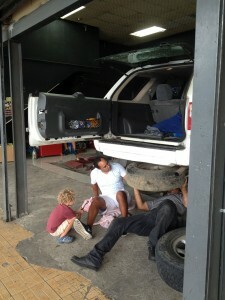 This is Atticus helping me show the worker at the tire shop in Paso Canoas how to remove our spare tire. This is the border. Panama is in front of us. Costa Rica is behind us. The Jerusalem Mall is to the left and other stores are to the right. Since this was to be the longest drive to date we had taken in our used car, I was extremely concerned about how it would perform. I felt like there was a 50/50 chance we either would have catastrophic engine failure, or would get caught in a tropical downpour and slide right off the road given how desperately our car needed new tires. 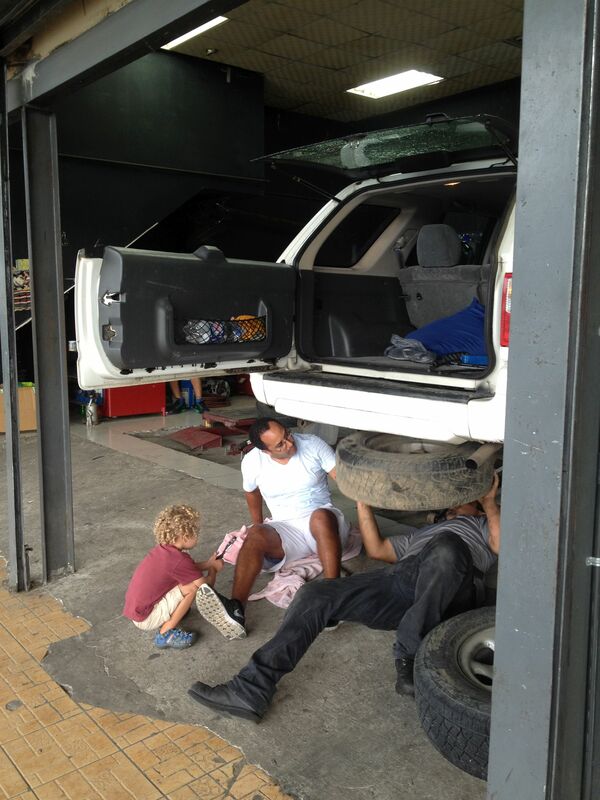 Because prices are so much better in Paso Canoas, one of the objectives of this trip was to replace our 4 drag racing slicks with new tires that had a deep tread. As one of the busier border crossings in all of Central America, Paso Canoas is a bit chaotic. There are government buildings, malls, stores, stalls, street vendors, and street hustlers all comingling together. If you look like you don’t know what you are doing, you are probably going to get approached by someone who will want to “help” you. Because our friends Tim and Kim (whose relocation to Costa Rica was documented on House Hunters International) gave us a fairly decent understanding of the process, we turned down assistance. As we moved from window to window, there were people attempting to guide us anyway, which added confusion to the whole situation. I am sure some of the guys are honest. But the ones we met were intentionally trying to make the process seem even more difficult than it actually was so that we would become frustrated and conclude we needed their help. One bit of advice I will offer is, if you are driving into Panama, bring copies of all of your paperwork. We would leave one office to go to another and then be sent back to the first office to have a copy made of a document so that it could then be given to the second office. If that sounds unclear or perplexing, that is because it was. If you think about it logically, it seems like there should only be up to 4 steps required to go back and forth between two countries: (1) get exit stamp on passport from Country A, (2) get entrance stamp on passport from Country B, (3) get exit stamp on passport from Country B, and (4) get entrance stamp on passport from Country A. But why would you think about this logically? Instead of writing the process we went through in paragraph form, I’m going to list the somewhat puzzling steps below so that someone who is making this journey in the future can print out this portion of the blog and carry it with them. But let me add this caveat. This is what happened to us on this particular day at the precise time we drove the car we own from Costa Rica into Panama. I get the sense that the steps could change from day to day and even from hour to hour based on who is working, or perhaps on how you look. So use this more as an informational tool than as a comprehensive inventory of infallible instructions. This is where you pay the CR departure tax. 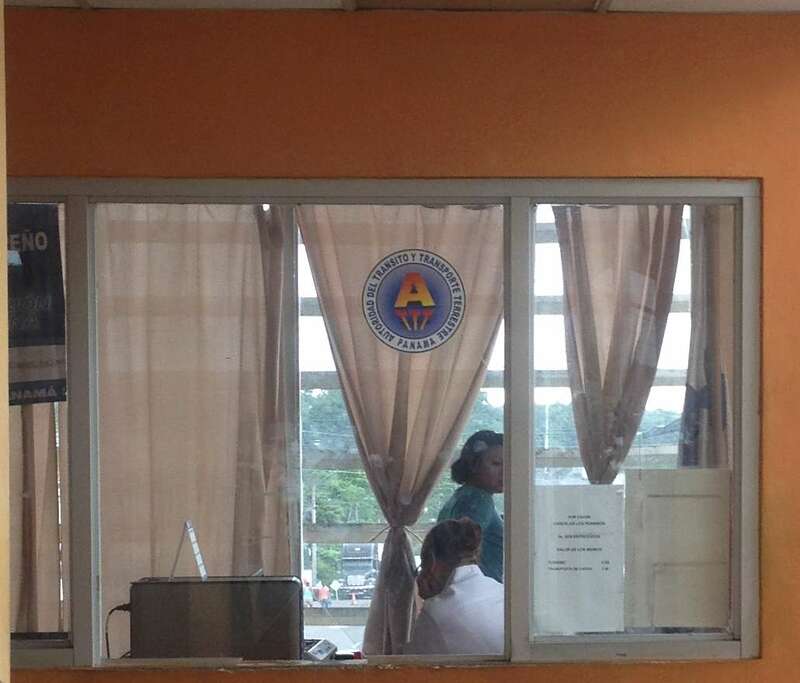 This is the Costa Rica immigration window. One side is for exiting the country and the other side is for entering. *Park your car, don’t leave a lot of items in it, and lock it up. 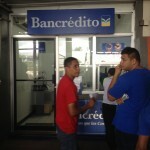 Go to Bancredito, pay the Costa Rica departure tax ($7.00 per person), and get the immigration forms. Complete the immigration forms for each person. 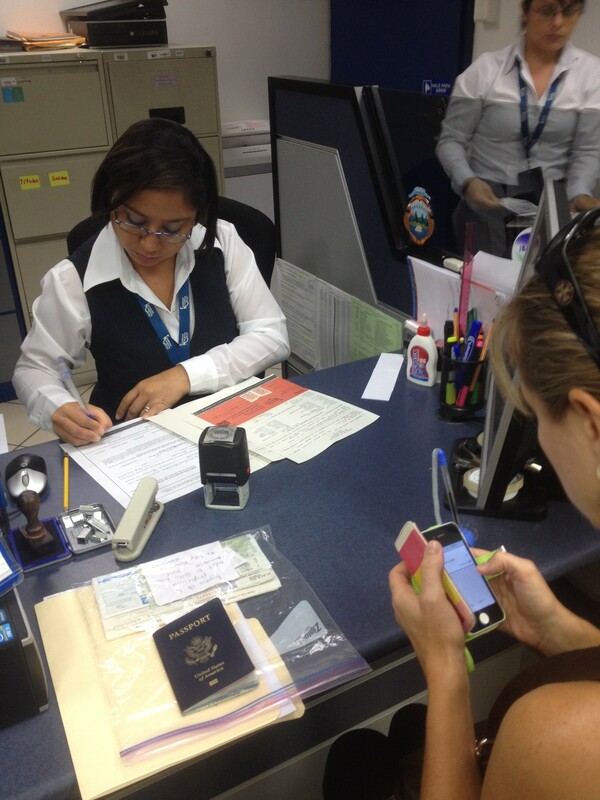 Take your completed immigration forms to the Costa Rica Salida del Pais window and get an exit stamp on each passport. *Go to the Costa Rica customs office (Aduana) and receive an exit stamp for your vehicle. 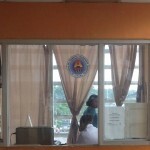 Go to the Panama immigration window (the side for entering the country). Each person’s picture is taken and each passport is stamped with an entry stamp. *Go to the Panama insurance window and purchase insurance to cover your vehicle while in Panama (it cost us $15.00 U.S.). 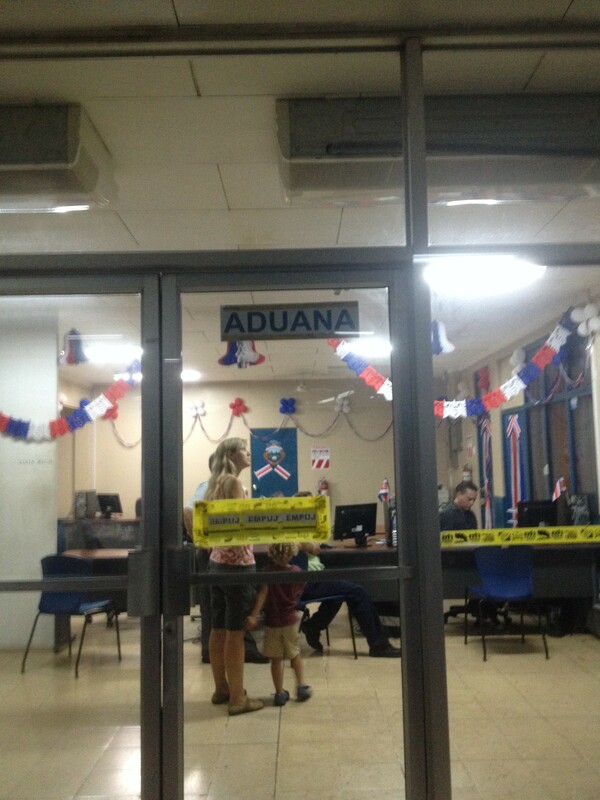 *Go to the Panama customs window (Aduana) and get an entry stamp for your vehicle. 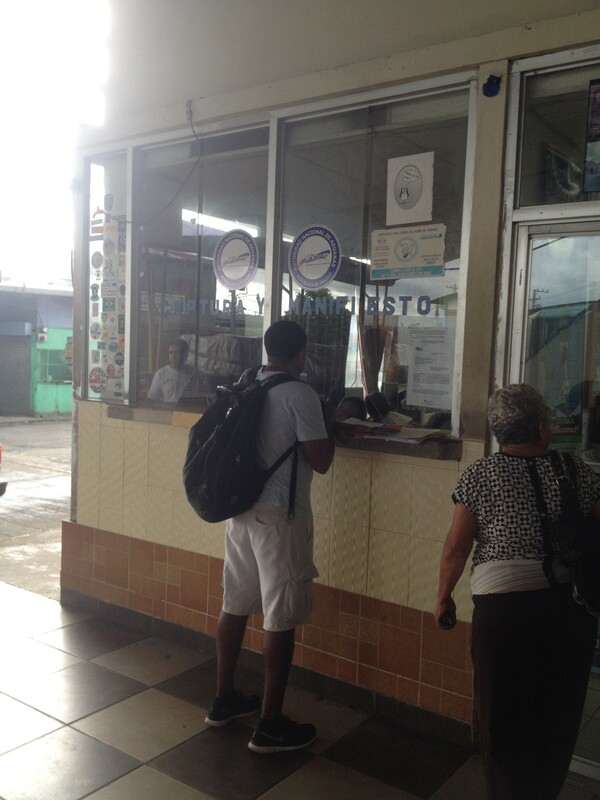 *Go to the Panama Transit Authority and Land Transport (upstairs) and get a stamp on your insurance document. *Go to the Panama fumigation desk and receive a stamped document listing the place your vehicle was fumigated (in our case, it was Paso Canoas). *Drive through the Panama fumigation bay. *Drive further into Panama and present your stamped insurance document to the Panama authorities. 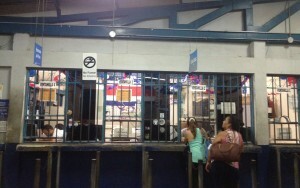 Go to the Panama immigration window (the side for exiting the country). Each person’s picture is taken and each passport is stamped with an exit stamp. *Go to the Panama customs window (Aduana) and get an exit stamp for your vehicle (they may ask to inspect the inside of the vehicle). Go to the Costa Rica Entrada al Pais window, get the immigration forms, complete those immigration forms, and get an entry stamp on each passport. *Go to the Costa Rica customs office (Aduana) and receive an entry stamp for your vehicle. *Walk out to your vehicle with the Customs officer for him/her to inspect your vehicle and its contents. Drive into Costa Rica tired and frustrated. Don’t forget to curse a lot about how ridiculously inefficient that whole ordeal was. *You only need to do this step if you are driving. 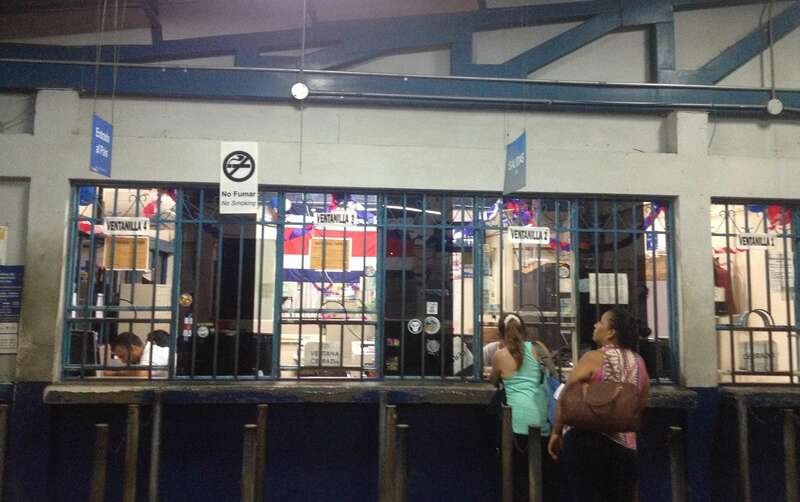 We were warned beforehand that one requirement for entering Panama this way was that we had to show Panamanian immigration that each adult had at least $500.00 cash with them. We were prepared to adhere to this requirement, but weren’t asked. Maybe it’s because they figured out that demanding people to walk around with wads of cash in the midst of bedlam is asinine. Incidentally, even if you drive to the border, you don’t have to actually drive all the way into Panama. Most people take advantage of the duty-free shopping right on the border. But we actually wanted to spend a few hours in Panama itself. All we did in Panama, however, was essentially drive to the Chiriqui Mall in David. Honestly, I don’t think the shopping there is any cheaper or any better than all of the options at Paso Canoas. We didn’t purchase a lot of items, so this didn’t apply to us, but we were told by others to pay attention to how much we were carrying back into Costa Rica. From what I understand, Costa Rica is not necessarily too keen on people shopping tax-free at the border and then bringing those goods back into the country. 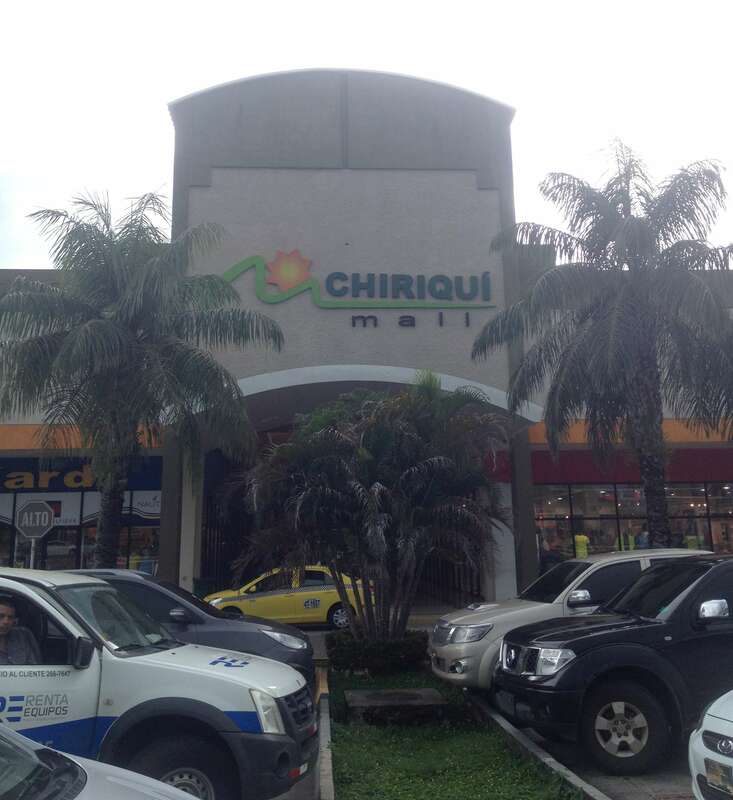 The outside of the Chiriquí Mall in David, Panama. Based on this trip alone, I obviously can’t make an honest assessment of Panama. As a family, we admittedly now unfairly associate the country with an exhausting border crossing, overcast weather, and an extremely long day. It was one of the only times so far on this sabbatical in which we simply didn’t have fun. How did Atticus do on this excursion? He was excellent for the most part, but had a meltdown in the car on the way back as he repeatedly yelled in anger, “I’m never going to Japan again!” In his defense, both Japan and Panama do contain the “pan” sound, so I guess it’s not that much of a stretch to get them confused (especially when you’re not quite 4 years old). Regardless, as it stands right now, none of us want to go to Japan ever again either. Whew… What a trip. Sounds like they learned how to be inefficient from the SC DMV. I have had some absolutely horrendous experiences with bureaucracy in the City of Pittsburgh. Costa Rica actually hasn’t been that bad in comparison. But this border crossing was unnecessarily complicated. In retrospect, however, it could have been a lot worse. At the time, Heather kept telling me to calm down before I got detained by the authorities. So yeah, if that had happened, it would have been pretty awful (or possibly funny)! Whew! That is indeed an ordeal. How difficult will the trip to Nicaragua be? I will be interested to hear about that adventure. Yep. It was. As for Nicaragua, just like so many other things, we’ve talked to people who have said it’s much harder and we’ve talked to people who have said it’s much easier. We just have to experience it for ourselves and then make a determination. Jamie: I cannot thank you enough for your post on “Crossing the Border from Costa Rica to Panama”. I feel this has been one of the most informative reviews I have read. As you and I had discussed at poolside, my wife and I have sold out and moved here to Jaco permanently, in hopes of enjoying our “Golden Years” in paradise. We must leave Costa Rica every 90 days just like everyone else, and had originally planned on a vacation every 89 days to accomplish this. We had considered driving to Panama on one of our “four vacations per year”, but thanks to your input, we have decided to forgo the stressful drive (and all it’s requirements) and accomplish this via a slow and hopefully non-stressful trip to Panama via bus. Thanks again for the information, and we will both be looking forward to reading your future post. Thanks. . . Don K.
I’m really glad to hear you found the post to be helpful. Bear in mind, we did it the hard way because we went beyond the border and traveled further into Panama. 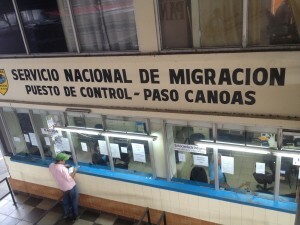 Most folks who drive seem to stop at the border town of Paso Canoas (which is shared between Costa Rica and Panama) instead of driving all of the way in. If you’re going to stop at the border, you can park your car in a “no man’s land” of sorts and leave the Costa Rica side of Paso Canoas by foot to shop on the Panama side of Paso Canoas. I know others who do the crossing via bus like you mentioned. Depending on your vehicle’s gas mileage, the bus is not only cheaper, but it is easier. A number of folks on it are doing the same thing that you are doing. So you can just follow suit as you navigate customs and immigration. Feel free to keep asking questions, and I’ll do my best to continue answering them. Planning to try it next month and glad to her you didn’t have to go all the way to San Jose to get preliminary paper work. Already I’m happy!!! Hi Faith. Let me know if you have any questions before your trip. Buena suerte! Do I need to stay out of Costa Rica for 72 hours or can I wait a couple hours and come back into Costa Rica? Hi Doug. Although I’m sure you’ve figured this out by now, there seems to be confusion over the 72 hour “rule”. My understanding is that this is not a law. I believe there used to be a Costa Rican Customs regulation that allowed visitors to import up to $500 worth of goods on a tax-free basis, but only upon the condition that they had been outside of Costa Rica for at least 72 hours. Perhaps people who were traveling back and forth between Costa Rica and a neighboring country originally stayed outside of CR for 3 days so as not to get hit with this tax. But, based on my experience (and on the experience of many others), the 72 hour period is not necessary. I’m so glad I didn’t try driving into Panama if I can buy my major purchaces like t.v.s,lawn mowers pool cleaner? at the boarder before having to cross. I thought buying a car in Panama would be a good idea …do you know the best way to purchaces a car or truck lawn mower ect. In jaco Costa Rica and I have cable t.v. But how hard would it be to get internet? This is Costa Rica, not Costa Mesa. Lower your expectations and relax. Trying to cram all that into one day from Jaco and back is almost as idiotic as staying in Jaco for more than a gas fill up and a beer, why not bring a tico friend to help if you’re that lost. Make couple days trip out of it, hitting the border early morning each way before temps and anger flare. Go see the country you “visited” for your passport stamp. Thanks for taking the time to read and comment on the entry that I wrote 2 years ago during my family’s time in Costa Rica. As my most recent post here indicates, it was a special experience for us. If you are familiar with the blog, you know that the intent of it wasn’t to necessarily tell you how to accomplish a family sabbatical. Rather, it was to show you that you can. I simply captured our trials and tribulations throughout the journey. 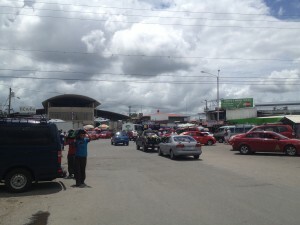 With respect to crossing into Panama, land crossings in general can be pretty chaotic. That day was no exception. To answer your question as to why we didn’t have a Tico friend go with us, aside from the fact that we hadn’t yet established the friendships we ultimately would have, we wanted to do this ourselves to see what was involved in the process. This is our general approach to traveling, and we never wavered from it during our time in all 7 of Costa Rica’s provinces. As for thinking of Jaco merely as a venue to get gas and a drink, there are countless gorgeous places in Costa Rica. Having visited a number of them, we’re really happy with the decision to have had our home base be in the Herradura/Jaco/Hermosa area. Aside from the fact that it proved to be a practical location for various reasons, the friendships we made there are invaluable to us. This was a beautiful experience about which we no regrets. Helping it go relatively smoothly was the fact that we had traveled to a number of countries over the years and did a ton of planning in advance. The bottom line is that I wouldn’t change a thing about our sabbatical, including the time spent navigating a bureaucratic obstacle course at an extremely busy border.